I’ve known Karen for some years now. She has always been a fitness person, and we’ve had great discussions about nutrition, competitions, training, etc. Karen really loves fitness, and has lived in the fitness world for years. She has even competed (and won! ), so when she wanted to come train with me, I hoped that I could serve her well, and fulfill what it was she was looking for! Karen is a hard worker, loves to train, and is Really Funny, so she was just a blast to work with! I like to say that Karen came to Hitch Fit to “put the polish” on it~and that, she did! 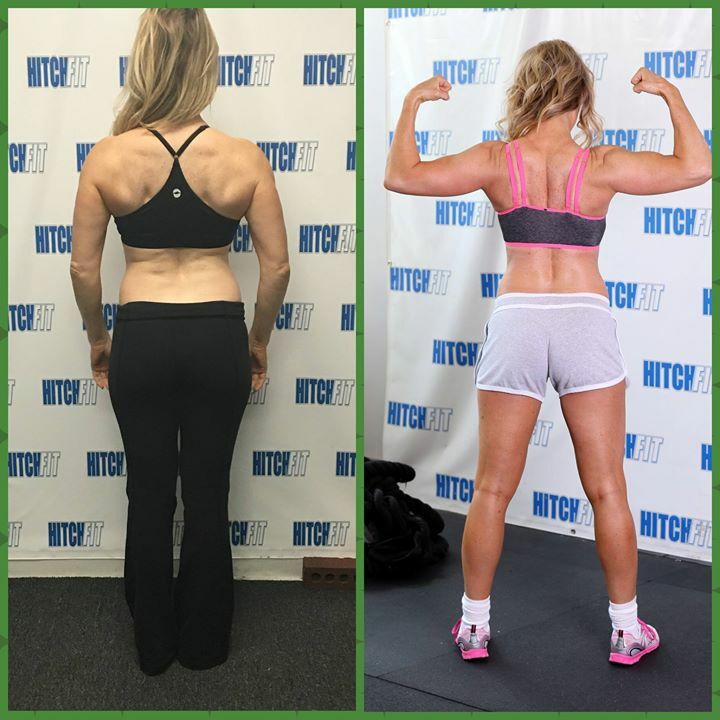 She lost fat, and built muscle, and her pictures show it! Please read Karen’s story below! “So for me personally, the before pic was a reality check. Until you have someone take a picture of you, I think you can easily bump along feeling fairly fit as I saw myself. Turns out, I was really more Fit (ish) – with the emphasis on the ISH part. Fit (ish) – Semi-fit. Kind of fit. Someone who likes the idea of being fit but equally likes food. I got to where I was at by just getting comfortable in the fall and winter months. Not working out as much, little to no cardio and “treating” myself a little too often. I had just spent the summer months leaning up to have some fitness pics taken, just a personal bucket list item for myself, so another reason I felt I deserved to partake in the foods I’d been missing out on. Apparently, a cheat meal or item turned into cheat days. And then for me, once I take in a certain amount of sugar, my cravings are consistent. So after all the Holidays and Birthday celebrations were over, I wanted to drop some body fat, maintain or gain some muscle and overall just feel better and have some more energy. I knew I needed to zone in on my macros, get some good workouts in, and incorporate plenty of cardio. Then enters Hitch Fit and my fabulous friend Nancy. We put together a plan, tweaked my nutrition, did more HIIT type workouts with strength training and I got back into the good habits that I know I’ll get results from. 1) Training with a female trainer is…. well…………..AWESOME! 2) HitchFit provides a great atmosphere and the one-on-one focus is amazing! The positive vibes and support are everywhere between the trainers and you definately feel a part of a family there. is now replaced with new healthy choices and most importantly you FEEL better! I do love to lead a healthy lifestyle so I feel like I’m at home again. This was a great experience, learned some new things and I highly recommend this to anyone wanting to make a change and live the results.